Here is my review of the brilliant concert given by Roy Wood's Army at the Sands Centre, Carlisle on November 30th. 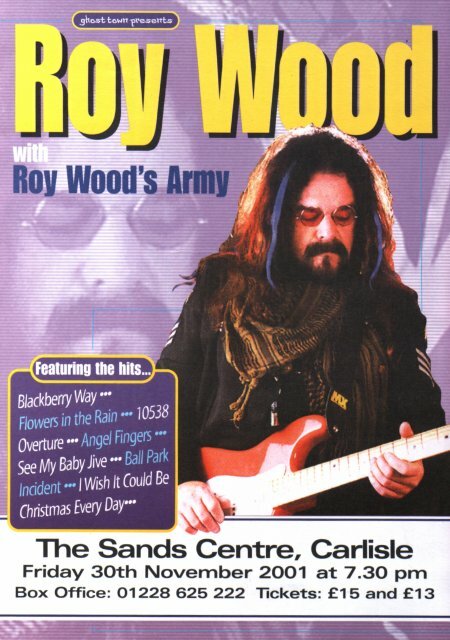 This was to be the first time that I had seen Roy Wood performing live and was greatly looking forward to the show. We decided to take our two kids, Emma and Ben with us to the show and both were excited about seeing Roy performing the Wizzard songs, especially 'I Wish It Could Be Christmas Everyday'. We were seated on the front row directly in front of Roy and the band. First onto the stage were the support act, The Gobstoppers. I'm not too sure what to say about this lot - they were so awful that they were brilliant!!! The five-piece band came on stage dressed up in glam-rock regalia, codpieces and high heeled silver boots and an amazing selection of hairstyles and make-up. They certainly got the near sell-out crowd of about 800 into the party spirit with some 'original' reworkings of glam-rock classics from Mud, Sweet and Slade and their dance sequence to the Village People's 'YMCA' was a sight to behold. After a short break, the lights began to dim and the 'Thunderbirds Theme' started booming out over the speakers as the band took to the stage. Then the crowd gave a rapturous welcome as the man himself took to the stage and launched straight into the Move classic 'California Man'. A couple of oldies next - 'Ball Park Incident' and 'Fire Brigade' which the audience were singing and clapping along to throughout. Next up there was total confusion on stage as Roy seemed to have no idea what the next track was going to be, and had to be put right by the band - many in the audience bantering with Roy jokingly throughout as he announced a new song 'House Of Love' which he said would appear on the next live album if he ever gets round to releasing it. Some old ones next, 'Angel Fingers' and 'Forever' followed by yet more chaotic scenes as Roy put on a new guitar which started wailing and screeching with feedback through the amps whenver he moved. The poor sound man was on & off stage half-a-dozen times with new cables and twiddling until Roy decided to wrap the guitar lead tightly around his arm and jokingly told the audience he was not going to move whilst performing 'Flowers In The Rain'. Another new one next 'Kiss Me Goodnight Boadacea' which was introduced by Roy with a short story explaining who Boadacea was etc. Another Move classic 'I Can Hear The Grass Grow' was followed by 'Roys Revenge' where all the band got a chance to put in a solo performance as Roy disappeared off stage for a while. Roy then came back on stage and introduced the Naylor sisters who sang 'Rescue Me' brilliantly. This song certainly got the audience clapping along nicely as we approached the final part of the concert. Now before I go any further, this is the point in the show which is quite 'embarrassing' for me in particular. As mentioned earlier there was quite a bit of banter between the band and audience and some of the girls in the band kept pointing and laughing in our direction and then I realised what was going on - our son Ben who is only 5 years old had fallen asleep !!!!! Goodness knows what Roy was thinking (if you're reading this Roy - sorry for this!!). After a few nudges, Ben sprung back to life as the band continued with the show with 'Are You Ready To Rock', 'See My Baby Jive' and 'Blackberry Way' which the audience sang every single word. As the band left the stage to thunderous applause, we wanted more, more, more.... and back they came for the classic show closing 'I Wish It Could Be Christmas Everyday' which was definitely the highlight of the show. And then it was over - a fantastic show by a fantastic band which I hope will come back here to Carlisle again in the near future and perhaps Roy will unveil some brand new material - and even better maybe a new album ?? ?